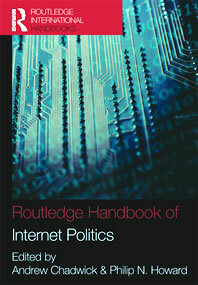 "In its impressive scope, the Handbook shows the resonance of internet politics as a field of study... The rigor of this scholarly work suggests that a positive orientation is not the product of blind optimism but rather the result of serious inquiry into the broad intersection of the internet and politics." - Professor Robert Klotz, International Journal of Press/Politics. "Exploring new territories in political communication, public opinion, citizenship studies and social movements ... This rigorous work will certainly serve as an excellent starting point for a growing number of graduate students who are considering doing research in the field ... Scholars in the social sciences will find here an essential update on the state of internet studies, which have now become almost everybody's business." - Professor Yves Laberge, Political Studies Review. "Without a doubt the handbook is an excellent reference work on internet politics in its broadest sense." - Dr David Stuart, Online Information Review. "The Handbook of Internet Politics is a timely contribution... Its deliberative and inclusive approach to the topic makes it recommended reading..." - Johannes Fritz, Political Studies Review, reviewing the paperback edition.